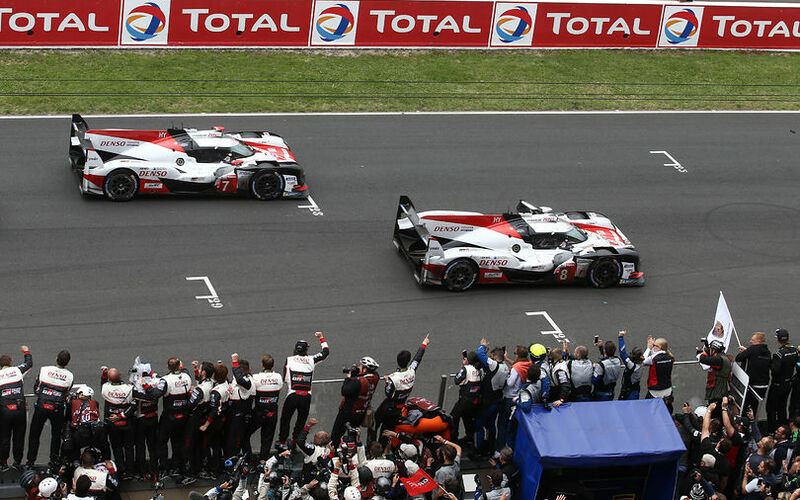 What is prize money like at Le Mans? Was prize money reduced this year with the exit of Porsche und Audi (entry fees)? Do winners make money there or is it a wash? Or a net loss? It's sad that a privateer team couldn't buy last year's 919s... They most likely would not have won but it would have been close. That's what is killing LMP1 as non-manufacturers can't even buy a second-hand hybrid. - The Q times were fairly similar. Only the stellar record lap last year was better. So the cars had more or less the same pace. Usually they would be 2-3sec faster, but as there was no competition Toyota just made the cars bulletproof without loosing pace. - Last year had more crashes, this year the long track repair, Safety Car time was comparable in the end. #2 Porsche plus 19 laps repair time did a similar number of laps like the Toyotas this year. The Porsche were cruising at some points last year with 3:30 laptimes when the Toyotas were out. - Last year the #2 Porsche was catching the LMP2 with 3:19 to 3:20 laps by driving to a save delta as Porsche did not want to risk another problem. So the Alonso stint during the night was also endurance racing...driving to a save delta. It was exactly at the timing of camera switching but looks like there was little contact between Toyota and Rebellion. Anyway forget the LMP1, GTE-Pro was epic. I am also getting very enthousiastic about the rumors that they are going to start a hypercar class to make up for the loss of LMP1. That would be great IMO, so many cars that I would love to see race: Project one, Valkyrie, Bt-62, FXX, the Mc Senna, Regera. It is a shame that all these hypercars are built and the only thing you ever find on them is a 1 second clip on Youtube of the thing starting up on a car show. If you claim to make the fastest car on earth, put it on a track to prove it. Lack of competition aside, I think it’s fair to say Alonso justified his inclusion in the team and made a meaningful contribution to the win. Just the small matter of the Indy 500 to go. I said that last year when a team running an year old Audi would have won (reportedly Roger Penske contacted them, but Audi decided against it). I'm sad for all the Toyota jokes and happy for Porsche GT team. Would be cool. The Valkyrie is on a whole 'nother level aerodynamically and chassis-wise, imo. They'd have to BOP it to oblivion to make the bricks and soap-bars more competitive. All the lap times are available here at hour 24 -> analysis by lap. For every race since 2011. Car #8 was 2m20sec behind car #7 on lap 169 and pitted on lap 170. I think that is when Alonso started driving in the night. From lap 170 you can see the gap coming down by 3-4 seconds per lap, and relative times of both car #7 and #8. The engines are compatible with the rules. If you look at the old open top cars (Audi R8 and R10 for example) then you can see they are Siamese F1 joined at the tub. So for headlights you could do that with the lights mounted in the nose. Definition of irony: The only time you have a flawless run is when there is no-one to compete against. BOP is a lie. It's like they choose who is going to win. Next year, the winner will be the Corvettes.